When you think of UGG boots, what do you think of? If you're like me, you think of the short boots that could pass as slippers. Don't get me wrong, I love that style of UGGs- I own like four pairs of them.. But did you know that UGG makes TALL HEELED BOOTS?!?! Well now you do! 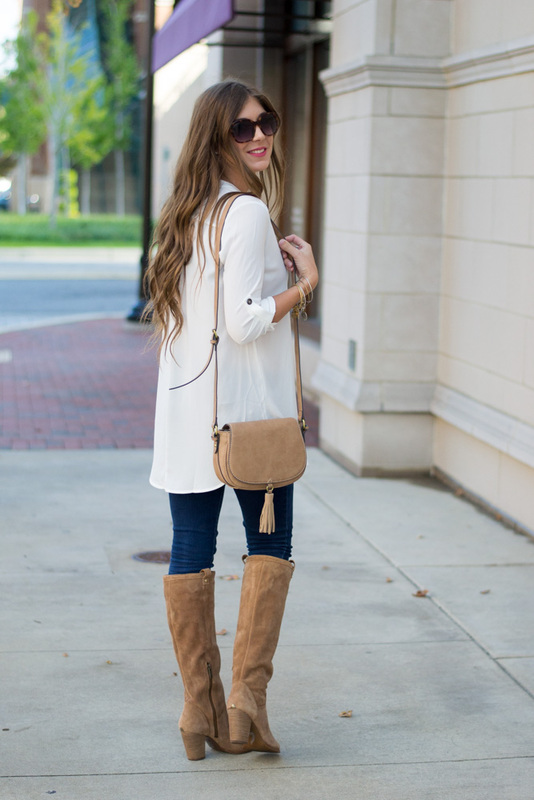 These tall suede UGG boots have quickly become a favorite in my ever growing boot collection. They even have the fuzz in the inside like your normal pair of UGGs have! One final thing to make you fall in love with these boots even more... they are water resistant! Yep, you're right I need these and I didn't even know it! The fact they're waterproof sold me. How amazing that you don't have to worry about the weather in these!? Just sent the link to the hubby for my birthday next month :) Which color is now going to be the dilemma! Happy Friday, babe! That outfit is really cute on you! Is that white tunic opaque or do you have to wear a cami underneath? I have that top is several colors. One of my faves! Love how you styled it! You are stunning!! 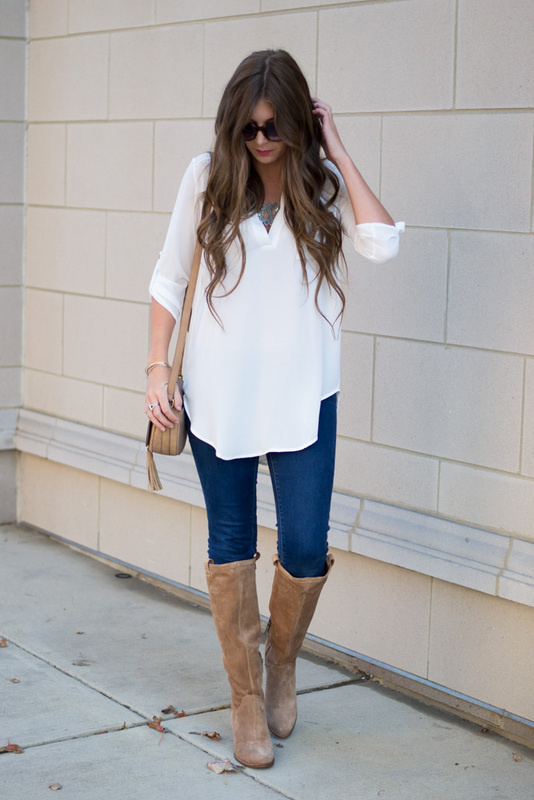 And , you have styled these boots to perfection!! 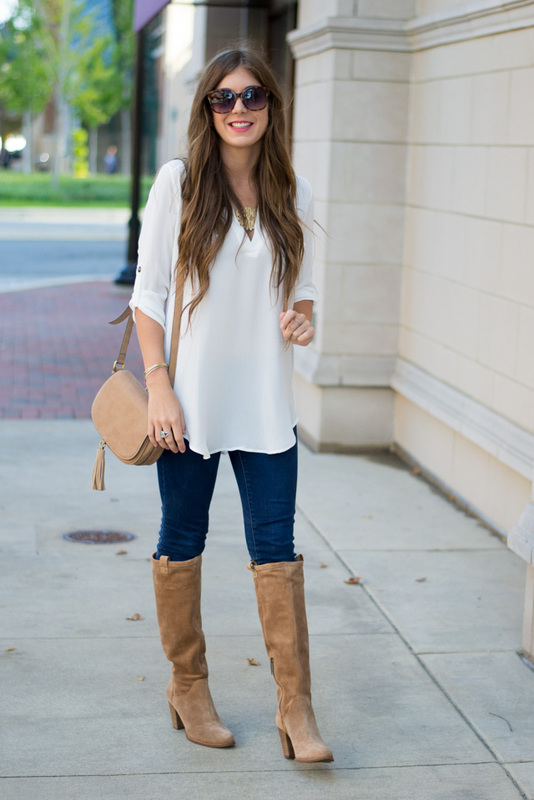 Loveeee these boots! I wouldn't have known they were Uggs if you didn't say so. I'd rock these! I am loving those boots! I have my tried and true regular Uggs, but these are so much better!!! Oh girl, you got that right! 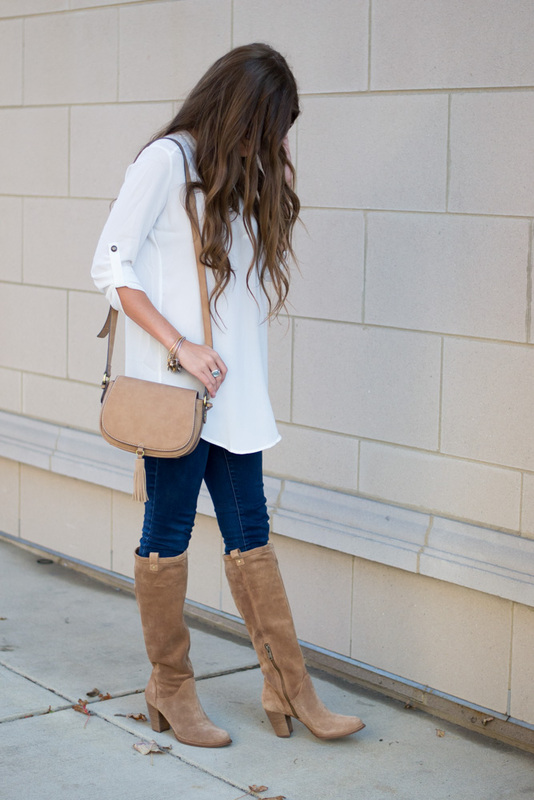 I am OBSESSED with those boots [insert heart-eye emoji]. Oh wow, you totally blew my mind, I didn't know UGGs had tall boots! Their super cute, and thats awesome that their water resistant! I definitely need to check them out! That's a pretty pair of UGG boots! I had no idea UGG had any other kind of boots but after clicking your UGG boots link I see there are so many different kinds of UGG boots! They are really nice and water resistant!? That's awesome! Love these so much! As a petite girl (only 5'0) it's hard to find knee-high boots that aren't too tall. Definitely going to have to try these on! Those boots are amazing! UGG is killing it lately!! Cannot believe these are UGGs!! They're so cute! 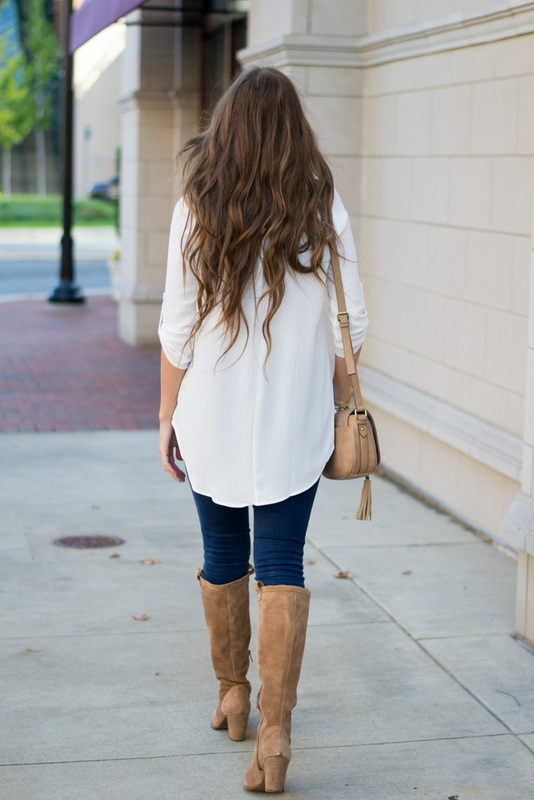 I have these same boots and LOVE them! Oh my gosh, I can't believe these are Ugg! You are so right! I 100% need these! So cute! I had no idea they made those boots!! I live in my little world of slippers and pure comfort boots...now they've added stylish...eeeekkkk!! Love the shirt you paired it with!! See you on Sunday!!! 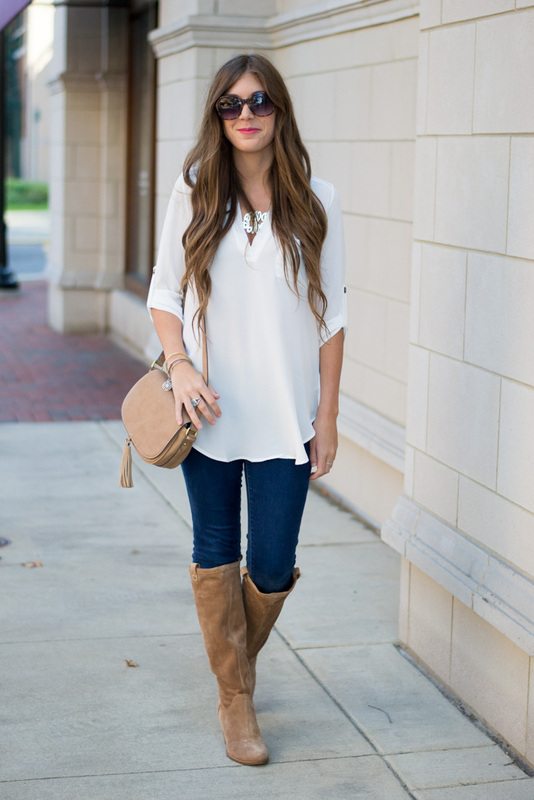 Love the vibe of this outfit its so cute and comfy looking perfect for brunch! I have these too and totally agree! I didn't even know Ugg made boots like those but that are adorable!!! So in love with these boots! Such a great color! I've been seeing these for awhile and have been wondering if they're as great as what people say! 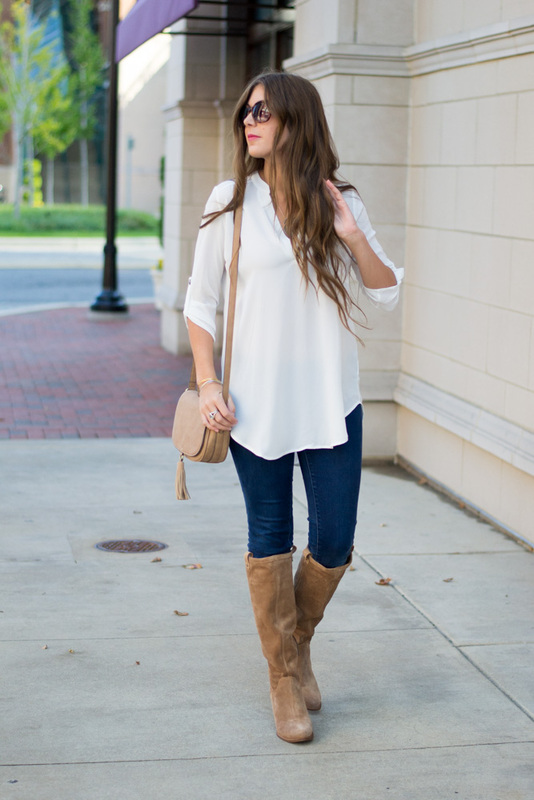 They look like the perfect boot! I love those UGG boots! And I totally agree with you about UGG boots. Those look so great for fall! Wow those are UGG boots?? And they're actually cute!! Love them! Okay I clicked on this blog because the title was so intriguing! I had to know what these boots looked like! I had no idea UGG made anything like that! These boots look amazing and sound even better and comfy!! I would have never guessed that these were UGG boots! I love these!